A member of the fried shallot-green onion-cilantro trifecta, fried shallots are my absolute favorite garnish. Alone or as part of the team, they add loads of flavor to just about any dish. 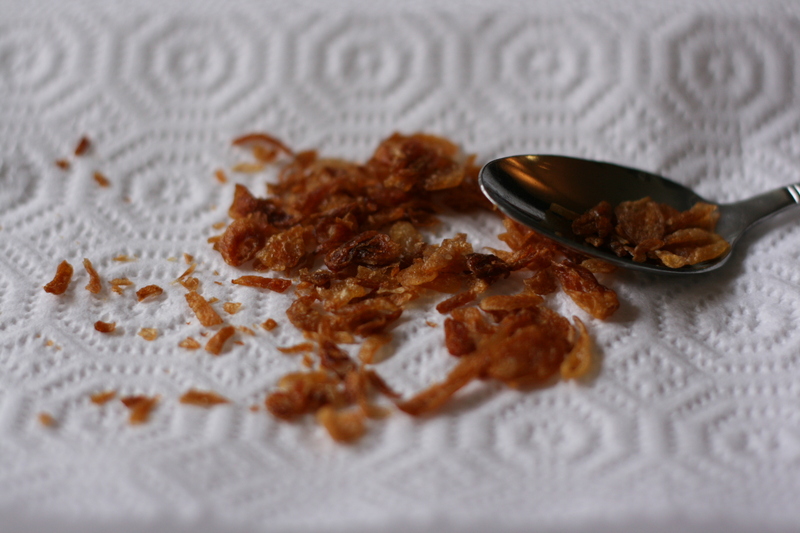 In SE Asian cooking, fried shallots (aka bawang goreng in Indonesian) are most often added as a garnish to soups, noodle dishes, and congee. I always top fried noodles and fried rice with fried shallots (ooh … I used ‘fried’ three times in one sentence!). And it’s a great all round substitute if you don’t have onions or shallots on hand. 5. On the Western front, top steaks, salads, pastas, and (everyone’s favorite Thanksgiving dish) green bean casserole with fried shallots. I have to admit I don’t enjoy deep-frying in my kitchen, so I’m inclined to buy fried shallots readymade. Look for golden hued specimens that are light-colored and crisp as opposed to dark and oily. However, my mom always made it from scratch. Whenever she slipped a big batch of sliced shallots into the oil-filled wok, I would stand clear, startled by the loud hissing and sputtering as the moist shallots hit the hot oil. As the sizzling calmed down, I would stand on my tippy-toes to peer into the wok to watch the shallots foam and dance about. When they were done, mom would scoop up the golden bits with a large wire-mesh strainer and drain the tiny shards on newspaper before starting all over again. Once the shallots were crisp and brittle, my mom would tip them into a large jar for safe-keeping. And whether we were eating oxtail soup or fried rice or gado gado, the crisp shallot curls would always make an appearance. If you’d like to have a go at it, be my guest! You can use any type of vegetable oil–from canola to peanut to corn–that has a high smoke point, just not olive oil. The leftover oil is delicious in a vinaigrette, tossed into a Burmese noodle salad, or can be used again to cook other savory dishes. Peel and cut the shallots lengthwise into paper-thin slices. Pour oil to a depth of about 1 inch into a medium heavy skillet or saucepan. Heat over medium-high heat until very hot but not smoking (about 350 degrees F). Tip in as many shallot slivers as will fit comfortably in the skillet (small batches are easier to monitor). The oil will foam and froth because of the moisture, but the bubbles should die down as the shallots cook. Using a slotted spoon or wire mesh strainer, stir continuously to ensure the shallots brown evenly but don’t burn. They will soften and wilt before turning light golden, 1 to 2 minutes. The timing depends on how hot the oil is and how thin the slices are. If the shallots start to burn quickly, adjust the heat accordingly. Once they are uniformly brown, remove immediately. Take them out sooner rather than later because they will continue to cook even out of the oil, and if they overcook, they will turn dark brown and taste bitter. Drain on paper towels. The limp shreds will eventually crisp up. Store in an airtight container for up to one week in a cool, dry place. Refrigerate if you prefer. What are your aha! 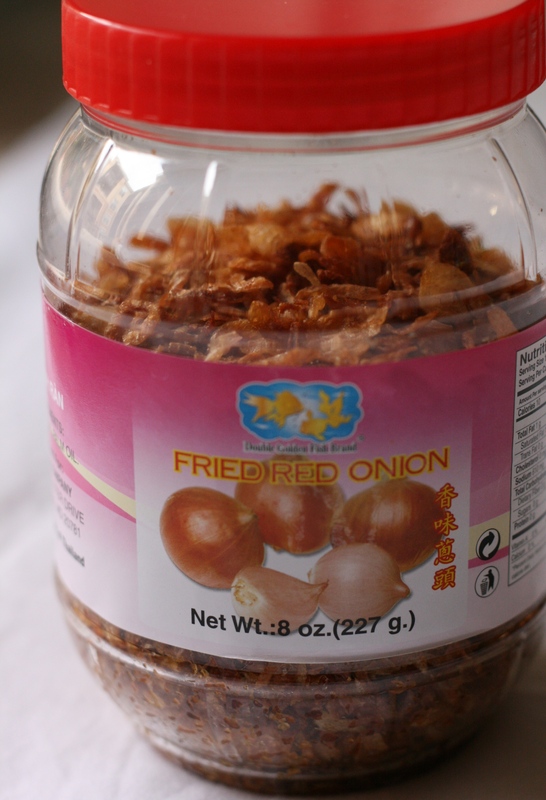 ways of using fried shallots? Previous postHomemade: Tofu–No Fancy Equipment Necessary! I’m too lazy to make sometimes and ended up by buying it here. As Tuty and you said, the Indonesian bawang goreng tastes better. Lazy me to make! Hi Pepy, Don’t worry, I totally understand how you feel. I’m often lazy in the kitchen too :). I think these would be a perfect topping for an updated bean casserole this Thanksgiving – the danger, for me, is I know I’d love to just snack on them! I thought it was interesting that you mentioned putting fried shallots in soup for flavor – when we get take-out fried chicken, I usually save the wings to drop in my chicken stock – it makes the stock amazing. I’m sure the shallots act in much the same way. Can you tell me what the difference is between an Asian shallot and one I’d find at any old supermarket? Hi Tuty, you are right! Nothing beats home-fried shallots. My mom does the same, she always brings home lots of bawang goreng from Indonesia. I’ve compared the Indo ones to the ones I buy here and the Indo ones are golden, light and crispy and have an overall better flavor and texture. So luckily for me, my mom shares :). Oh that looks delicious!! I love keeping a jar in the cupboard but the idea of frying my own and using the oil sounds good too. I love fried shallots! I do the same like you too!